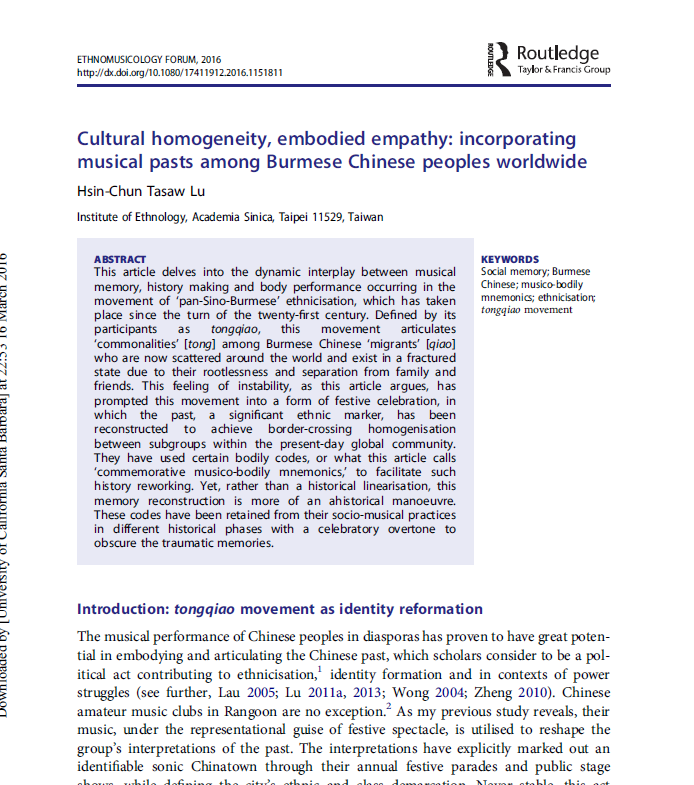 This article delves into the dynamic interplay between musical memory, history making and body performance occurring in the movement of ‘pan-Sino-Burmese’ ethnicisation, which has taken place since the turn of the twenty-first century. Defined by its participants as tongqiao, this movement articulates ‘commonalities’ [tong] among Burmese Chinese ‘migrants’ [qiao] who are now scattered around the world and exist in a fractured state due to their rootlessness and separation from family and friends. This feeling of instability, as this article argues, has prompted this movement into a form of festive celebration, in which the past, a significant ethnic marker, has been reconstructed to achieve border-crossing homogenisation between subgroups within the present-day global community. They have used certain bodily codes, or what this article calls ‘commemorative musico-bodily mnemonics,’ to facilitate such history reworking. Yet, rather than a historical linearisation, this memory reconstruction is more of an ahistorical manoeuvre. These codes have been retained from their socio-musical practices in different historical phases with a celebratory overtone to obscure the traumatic memories.